Sun protection should really be a vital part of all of our daily beauty routines all year round. It's a must to prevent melanoma, sun damage and premature aging. I'm personally always on the lookout for the latest in sun protection products as it's a real concern of mine. I recently had an opportunity to try out some products from the innovative Soleil Toujours line which combines safe sun care with luxurious skincare. About the Brand: Soleil Toujours which means "sun always" presents a luxurious new paradigm in anti-aging and beautifying skin care by starting with sun protection as the foundation for skin's optimal health and appearance. With refined textures, delicate natural fragrances and a modern and elegant brand aesthetic, Soleil Toujours delivers effective and safe skin protection, superior anti-aging and corrective benefits, all with a key focus on mineral based sunscreen actives, avoiding all potentially toxic and controversial chemicals. The product line includes Soleil du Midi for intense sun exposure, Soleil Toujours for daily protection and Soleil Luxe for post sun care. Key Ingredients: An innovative proprietary EcoSun complex is found in Soleil Toujours products. Cornerstone ingredients include red algae, vitamin C ester, vitamin E and bisabolol to provide powerful anti-oxidant and anti-aging benefits while working to reduce UV-induced DNA damage. The collection is free of phthalates, sodium laurel sulfates, propylene glycol, petrolatum, synthetic fragrance, synthetic color and is coral reef safe, hypoallergenic, vegan and gluten-free. Packaging: Sophisticated and modern black and gold tubes and bottles that you wouldn't mind seeing in your bathroom cabinet or pulling out anywhere. Daily Moisturizer SPF 20: I liked this enough that I would have no problem switching it out as my everyday moisturizer. Besides UV protection, it's supposed to firm skin stimulate collagen and fade dark spots. I found it effectively moisturizing with a light pleasant scent and creamy texture. And my BB cream applied just fine right over it. 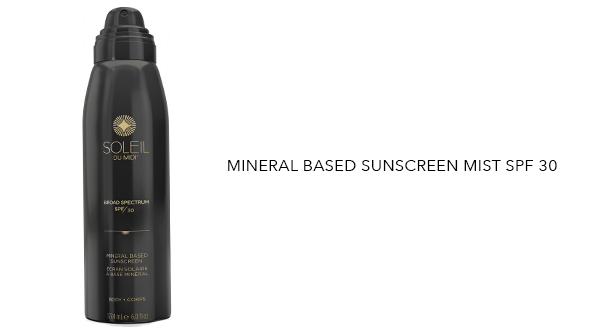 Soleil du Midi Sunscreen SPF 30: What I liked best about this mineral based photo stable formula is that it has no distinguishable scent and doesn't feel like typical sunscreen. It absorbed very easily and while hydrating didn't feel greasy or sticky on top of my skin. There was also no chalky texture or look to it which was nice. 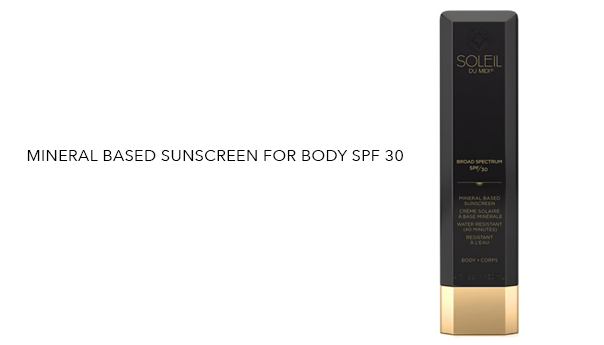 Soleil du Midi Sunscreen Mist SPF 30: I love the ease and convenience of spray applicators for sunscreen. This one is lightweight, quick drying and fortified with potent antioxidants, vitamins and botanical. I wouldn't mind having it in my bag during the summer months for touchups. It does give off a slight scent initially but I didn't find it offensive and it wore off pretty quickly. 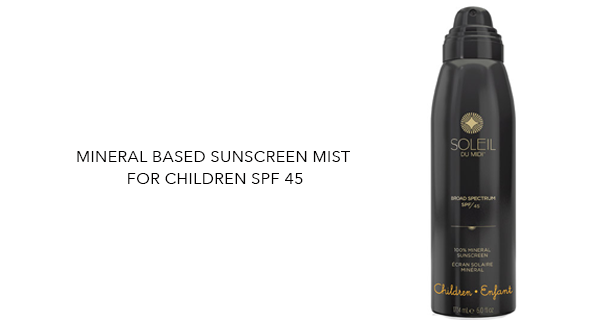 Soleil du Midi Sunscreen for Children SPF 45: This spray felt a little heavier with more of a scent than the SPF 30 one for adults but I didn't really mind it for the extra sun protection. I don't have children but I can see this working just as well for adults. Après Soleil Exotic Shimmer Oil: This is made to soften your skin post sun exposure. While the moisture, glow and subtle shimmery bronze color this product imparts was nice, I wasn't all that crazy about the scent which was just too overwhelming for my preference. Based on the products I tried, overall I think this line is a winner and I would purchase it. The added benefit of anti-aging skincare that it provides along with effective and stable broad spectrum UVA and UVB protection is an important factor for me because it makes it easy to streamline my routine. The products felt good and didn't irritate my sensitive skin and I can feel good knowing that I'm not putting anything harmful on my body. I also think the price range is competitive given the quality of the product. 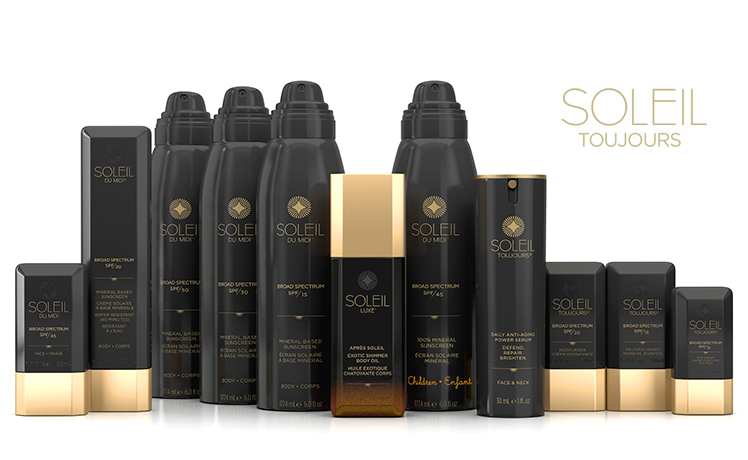 The product line is available through the Soleil Toujours website and an exclusive range of retailers, resorts and spas worldwide. Soleil Toujours was kind enough to offer rolala loves readers a special 10% discount with the code: launch10 through the end of May. You can learn more about Soleil Toujours and their entire sun care line by visiting their website and be sure to connect with them on Twitter for the latest news and promotions. Do you currently incorporate sun care into your beauty routine? Disclosure: I was sent samples for the purposes of this review. I was not provided any other compensation and all opinions expressed are 100% my own. Hi doll these products sound amazing great job with the presentation and your information. holy cow $145 for sunscreen? i'm not sure i can spring for that lol esp since i'm SO allergic to some ingredients. i have to be super careful about which ones i buy. ive tried so many brands even high end and the one that actually works is a $9 of Banana Boat Sunscreen for Babies. lol. Looks so luxe. Sun protection is so important especially here in sunny Australia. The packaging of these are super luxurious! And I completely agree, sunscreen should be a vital part of any routine! It sounds like a very nice product!! products sound amazing. and i love the gold and black packaging! I love the black packaging. Thanks for sharing this new product with me. this is such an interesting product! especially because it offers broad spectrum protection. I do agree with you, I use SPF everyday. it's my daily essential. What a great review sweetie! They sound great! First thing I thought is that I love the black and gold packaging! I need to be better about protecting my skin from the sun. Thanks for sharing your review! These products sound good Rowena!!! LOVE this packaging! It makes me want to use it at a resort by the pool. FANCY!!! I love things like this that don't have a scent. That's awesome. I'm also a big ingredient person! Looks great! 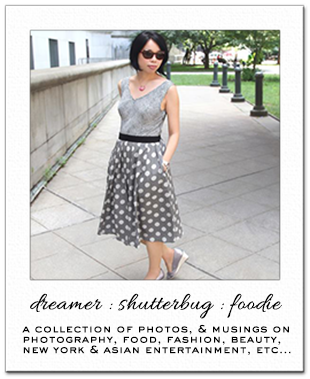 Thanks for showcasing this brand Rowena! They have some really good products to protect us from harmful sun rays. I think people are taking sun protection a lot more seriously nowadays. Great job. They sound great! I don't normally use sun care products, but I definitely should. Great post! Ever since last year when I found out that all of the lights in the office where I work are UV lights, I've become super paranoid about UV protection (who wants to be exposed to UV rays for 8 hours, a day 5 days a week!). I like that these are natural and don't have very heavy scents. I've never used sun care products before but planning to spend a LOT of time on the beach this SoCal summer! Thanks for the reviews, will definitely put these babies on my to buy list! thanks for sharing these great suncare products - we really do need to protect from the harmful sun. Wow looks like a luxurious brand and great for the summer! Oh this does sound like a good line, yep it is that time a year when I need to switch to SPF 30 for daily wear. And SPF 50 and above if I am going to be out doors for any length of time. This seems like a nice line, it's generally an all out war between me and the sun in the summer so it's nice to see options. I agree it would be nice to be able to have citrus plans/fruits in the Northeast but then I'd be sad it was so warm. :) I think my plants are so tiny that it will take a few years to get some fruit, but I'm excited about it. The only problem is my cat thinks my plants are her own personal lettuce dispensers and likes to eat them so I have to be really careful. Love the packaging. Love products with sunscreen. these products sound pretty great! I will have to check them out! Never heard of this product, but glad I did now. Ill have to get it before summer starts. This is an excellent review Rowena, its thorough and really helpful, I like the sound of the first sunscreen, the texture seems good. Thanks for your opinion on my last post, hope you're having a great week so far. So true! I grew up in the sun in Hawaii, but only in my late 20's realize how important sun protection is! I hope I'm not too late, but definitely put the protection on whenever I go out in the sun. Thanks for the intro to this brand, I'm definitely gonna check them out! These sound like wonderful products. Sun protection should definitely be apart of everyone's daily routine. These sound great, and I like the packaging! I don't mind having this whole line now that summer is approaching. Thanks for a review Rowena. This looks lovely Always important to use sunscreen 12 months a year Will look into this line Thank you ! !